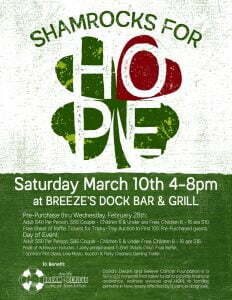 DDBCF is excited to announce our 2nd Annual Shamrocks for Hope will take place on Saturday March 10th at Breeze’s Dock Bar and Grill, in the Viking Yachting Center, in New Gretna, from 4-8pm. The event is family friendly! 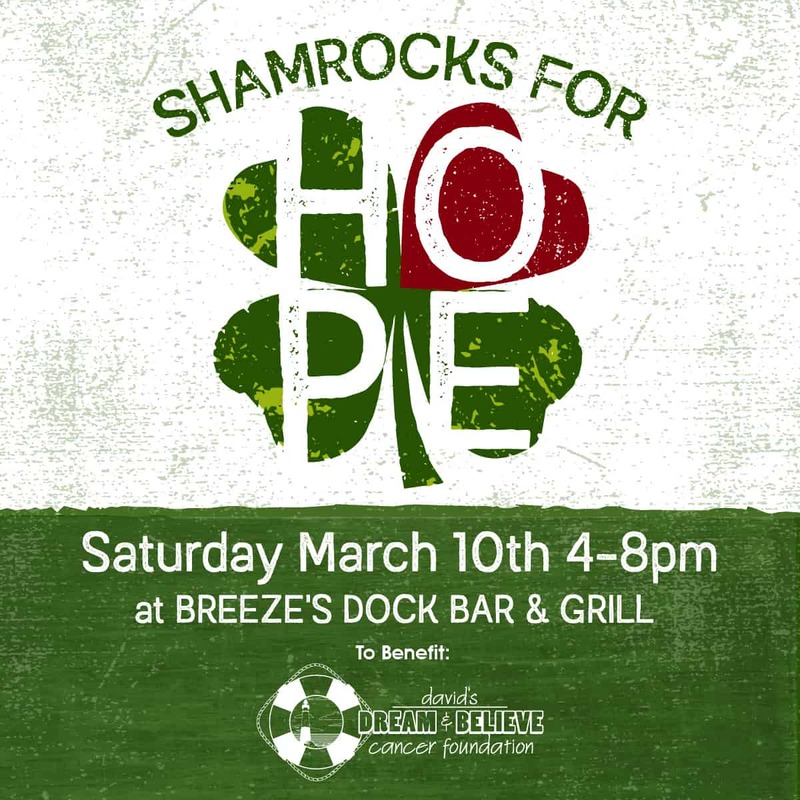 In 2017, Patient Advocate Susan Buzby wanted to create and manage a new event in order to “Pay Forward” the kindness, generosity of spirit and HOPE to current patients that were offered to her family through David’s Dream & Believe Cancer Foundation. 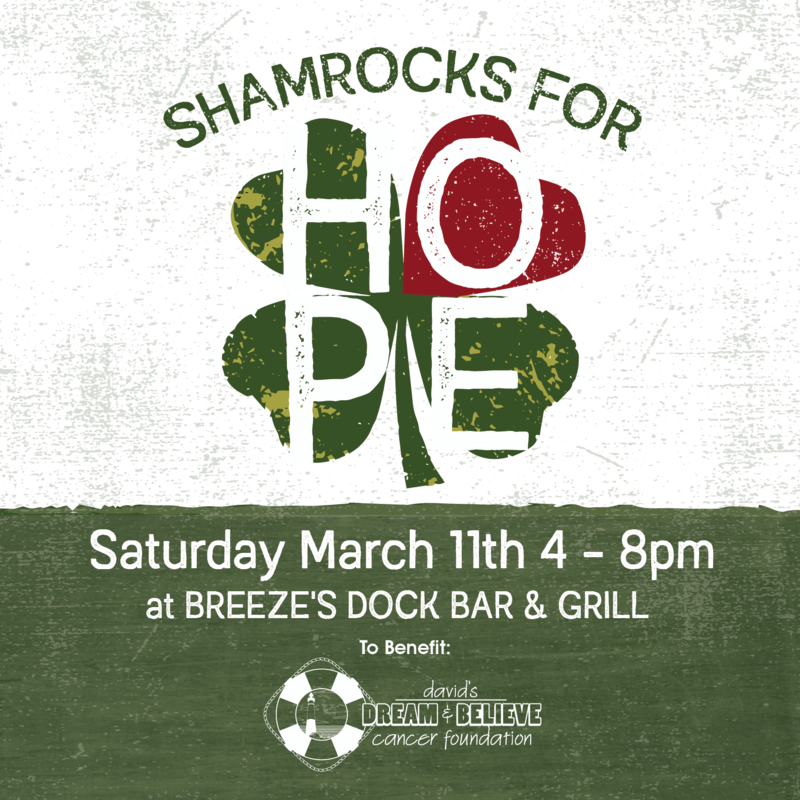 Susie will serve as our Project Manager for this event and we are excited to have Shamrocks kick-off our 2018 event calendar. Tickets can be Pre-Purchased through Wednesday February 28th in the Shop section of our website by clicking HERE. (Jetty Printed event T-Shirt Guaranteed with Pre-Purchase Only). A ticket will include: Free Buffet, 1 sponsor pint glass, 1 event t-shirt, Auction, Live Music with Jason Booth & Ted Hammock, Face Painting and Party Crashers Gaming Trailer.